We teach Pilates classes for beginners, as well as for advanced students, stretching you and developing your practice with each session. Whatever level you are at, our experienced teachers can help, offering a range of physically and mentally stimulating classes to boost body and mind. We design our classes to be challenging and engaging, bringing in elements of classical Pilates and mixing them with newer disciplines. This ensures you will be stretched in each session, coming away feeling that you have learnt something new, as well as feeling all the benefits of a good workout. Each class will focus on a different theme, so you can keep exploring Pilates in greater depth. For this reason, we encourage you to book a block of classes, as this will give you an all-round experience of Pilates. HIIT cardio power Pilates We offer specialist classes in high intensity interval training (HIIT) cardio power Pilates to give you an energetic workout. Combining high-energy cardiovascular exercises with Pilates recoveries, the workout is designed to condition the whole body. A fitness assessment will be required before you can begin this programme of intense exercise. Contact us to book your initial fitness assessment. Pilates in standing This practice is designed to improve balance whilst building muscle strength. You will work with balance pads and equipment as well as carrying out bodyweight exercises, helping to engage your core and tone your legs. Working in a standing position helps you to think about the practical application of Pilates in your everyday life. HealthyBack This class is designed for people with back pain and problems. We teach exercises to strengthen the back and analyse your body and posture, making personalised recommendations to help you move beyond the pain. Once you have taken the HealthyBack course, you can attend a general Pilates class. Back4Good This is a class designed for people who are recovering from acute or chronic back pain, helping you with your rehabilitation. You will attend eight sessions in total, coming along to one class per week. The objective is to move into a mixed ability Pilates class once you have completed the course. Arc barrel The arc barrel is a curved piece of equipment that can be used to make exercises easier, or to make certain moves more challenging. Pilates using an arc barrel helps improve balance, strength and stability, which will feed into the rest of your practice to make you a better-rounded practitioner. Semi-private and one-to-one lessons Book a class for a small group, or book a one-to-one session. This is the perfect way to concentrate on areas you might be finding more challenging and really develop your own personal practice. It also gives us the chance to assess your movements so we can give you personalised advice. 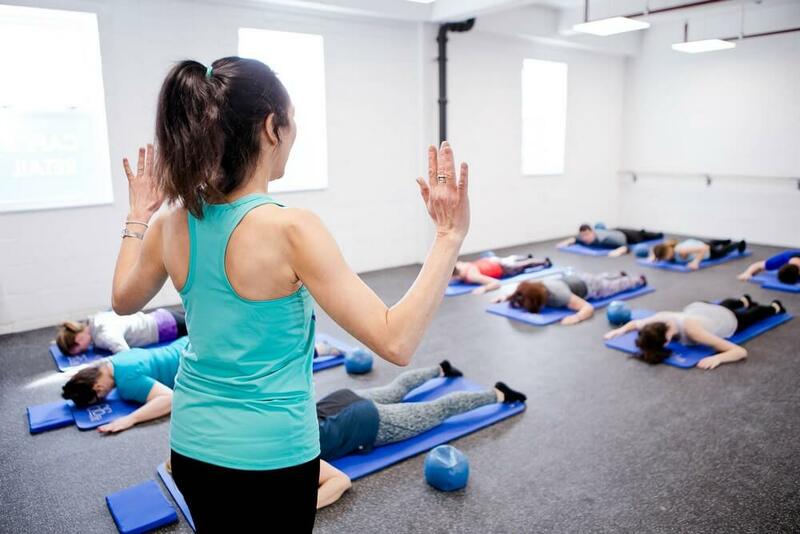 Matwork classes These classes embrace classical and contemporary Pilates practice on the mat, taking you through a range of movements with instruction from your teachers. You will use a variety of small equipment, such as soft Pilates balls, rollers, and magic circles, to name but a few. Yes! Pilates is great for everyone and offers a multitude of benefits, whether you’re a complete beginner or have been practising for many years. Better flexibility. Pilates stretches and elongates muscles, allowing you to gain flexibility without the danger of injury. Joint health. Pilates stimulates the production of synovial fluid, lubricating joints to loosen them up. Toning and definition. Work towards a toned, lean body shape with muscle definition. A calmer mind. Pilates is known to be very therapeutic, calming the mind and helping to relieve stress. Better balance. Practice makes perfect – the more you work on your balance, the more it will improve. Strength. Pilates works to strengthen your body and build muscle from your core, giving a greater range of motion. Pilates is practised in bare feet or ToeSox (sold in our retail area), so you won’t need specific footwear. Mats and any other equipment we use will be provided, although you are welcome to bring your own mat if you prefer. 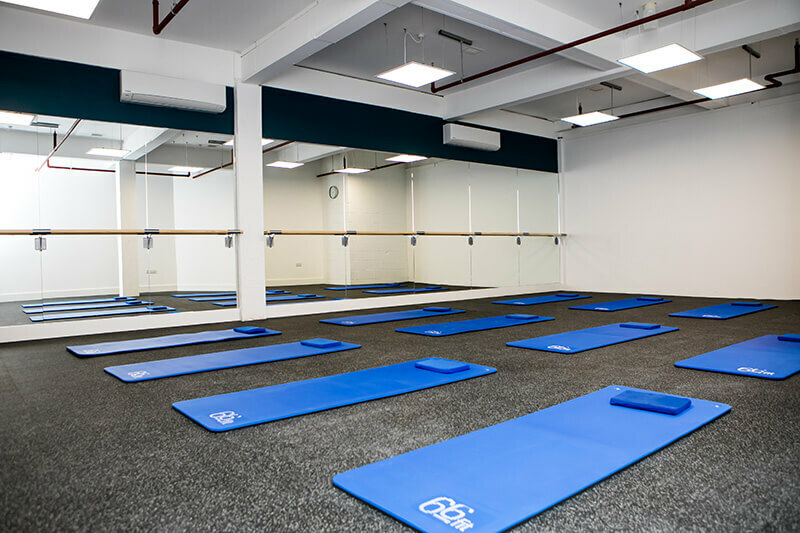 Our studio buildings are a part of the Tonbridge community, complete with an on-site café, treatment room and three well-equipped exercise studios. Don’t just pop in for a class – take the time to focus on yourself and enjoy a healthy treat before you leave. See inside our studio buildings. When you’re new to our Pilates studio, we always recommend an initial assessment to allow you to get the most out of your sessions with us. We will work with you on a one-to-one basis, carrying out a full body reading, examining joints and assessing musculature. This is helpful no matter how much experience you have – it’s always beneficial to understand more about the way your body works. We can then make personalised recommendations and give you tailored advice, so you can improve your Pilates practice and work safely in the knowledge that you’re doing the right thing for your body. It’s so simple to book. Use our online booking system to book your Pilates class online and receive immediate confirmation.